Croton Plants | How to grow them & plants for sale. You don’t have to visit Queensland to find Croton plants. They are naturally found in warmer climates, however they are also very popular as indoor plants. 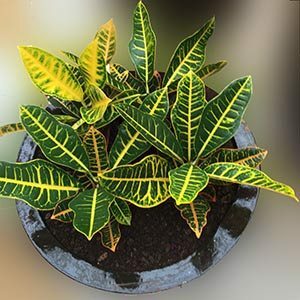 Crotons are also referred to as the caricature plant, Codiaeum variegatum is one the more common species of Croton plants found in sub tropical to tropical gardens. It is the colourful cultivars that are becoming increasingly popular. Grown for the brilliantly coloured glossy foliage, the colour range varies from green and yellow through to pinks, reds and orange. These are a variable group of plants. They come in a number of foliage forms including broad and narrow leafed varieties and are widely grown outdoors in warmer climates, from Brisbane north. However you can grow them indoors, in containers if you wish. Crotons are a tropical foliage plant or tree originally from The Pacific Islands and Indonesia. In cooler areas Crotons are used widely as an indoor plant. Croton plants are so popular the even have their own society The Croton Society. Codiaeum variegatum is perhaps the most popular of the genus. Widely used as an indoor plant and excellent in containers where the foliage adds colour all year round. Cultivars include Croton Afrika, Congo, Thamara Ice, Zambesi, Rina, Petra, Mammy, Zanzibar, Thai Princess and Picasso’s Paintbrush . Crotons require a reasonable amount of light to develop the colour in the foliage that we all admire. They do not like to dry out and prefer warm and humid rather than hot and dry conditions. Feed regularly throughout spring and summer for best results. Crotons may be grown from cuttings, however they are not the easiest plant to grow. In commercial nurseries tissue culture is widely used. We are often asked if you can grow Croton plants in full sun. The answer is yes, however this will affect the foliage colour. In sun the foliage colour is more vibrant, however if they get to much sun the colours are not as clean. So try for good morning sun and some afternoon shade. If the colours are a little dull, place them in more sun.